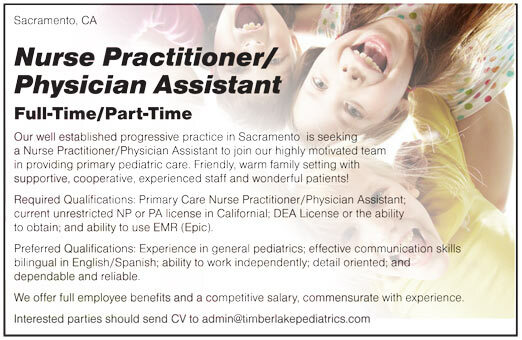 Our well established progressive practice in Sacramento is seeking a Nurse Practitioner/Physician Assistant to join our highly motivated team in providing primary pediatric care. Friendly, warm family setting with supportive, cooperative, experienced staff and wonderful patients! Required Qualifications: Primary Care Nurse Practitioner/Physician Assistant; current unrestricted NP or PA license in Californial; DEA License or the ability to obtain; and ability to use EMR (Epic). Preferred Qualifications: Experience in general pediatrics; effective communication skills bilingual in English/Spanish; ability to work independently; detail oriented; and dependable and reliable. We offer full employee benefits and a competitive salary, commensurate with experience.